Welcome to the Eighth Edition of Eyes on the SRC. There are no resolutions directly pertaining to the district’s most recent assault on public education, namely the Hite administration’s placement of four more neighborhood schools into his “Turnaround Network”. This month, we simply follow the continual erosion of school staff and resources and the continued outsourcing of services. At the Monday February 29 hearing of the Education Committee of City Council, Dr. Hite announced that he would be creating more Turnaround Schools by the end of the week. That Friday, the names of the four elementary schools to be “turned around” were released: Roosevelt, Munoz-Marin, S W Mitchell, and Rhodes. Principals and teachers would have to reapply for their jobs, and the district could eliminate the entire staff if it chose to. A series of community meetings were scheduled for the following week, the first one, at Roosevelt, to be held the following Monday—giving the parents and community minimal notification (shades of the October 2014 SRC last-minute/early morning meeting to cancel the PFT contract). APPS members have attended all four meetings, and the level of anger and frustration voiced by parents and community members is unprecedented. These schools have all been though some kind of conversion—or two—in the past five to ten years. Parents at every school said that they would fight to keep their teachers. District staff has been unable, or unwilling, to answer basic questions such as where the funding will come from, how the conversion would take place, why the decision was made before the community meetings, and why it is necessary to get rid of teachers and principals. Thursday March 17 at 4:15 on the steps of 440 (before the SRC meeting). 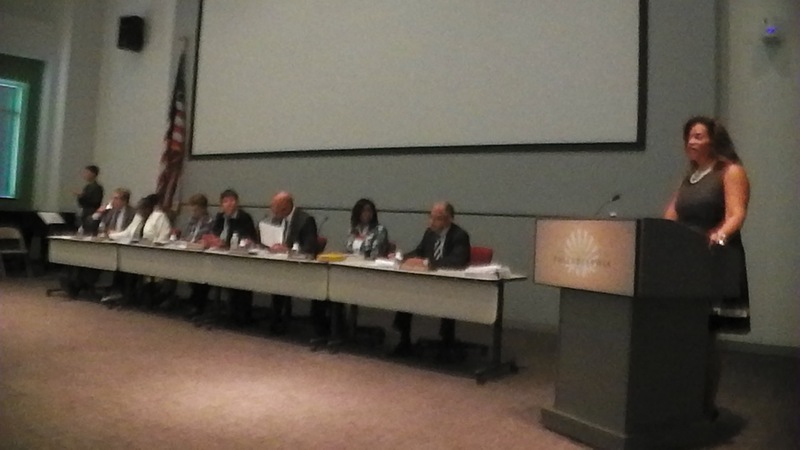 Click here to read the APPS analysis of proposed resolutions to be voted on at the March 17, 2016 meeting of the Philadelphia School Reform Commission. Welcome to the third edition of Eyes On The SRC. According to the latest bombshell dropped by Dr. Hite 5,000 students will be impacted by his continued drive to create chaos and turmoil within the District instead of insuring that every school has the necessary resources. We are hoping that the next SRC meeting will be filled with public outrage over the impending changes. The next SRC meeting is Thursday October 15th at 5:30. To register to speak you must call 215 400 4180 by 4:30 on Wednesday October 14th. It’s best to say that you’re a teacher, parent, or community member because only “one member of an organization can register to speak” (from the District website). “You are not defeated until you give up the fight.” Jose (Pepe) Mujica, former President of Uruguay. APPS Questions and Responses are in boldface. Does this include all the new hires at 440? What are their salaries? RESOLVED, that the School Reform Commission hereby ratifies the appointment of the following persons to the positions, on the effective dates through September 30, 2015 and at the salaries respectively noted, as recommended by the Superintendent, provided that: (a) continued employment of persons appointed to positions funded by categorical grants is contingent upon the availability of grant funds; and (b) persons appointed to positions funded by operating funds, shall report to either the Superintendent or the Deputy Superintendent or their designees, and shall serve at the pleasure of the School Reform Commission. So many questions. Why Mastery Charter School District (let’s call it what it is)? Why not use teachers from Masterman or Central or McCall, (or other district schools?) Why aren’t District teachers going into Mastery schools to coach them? Isn’t this supposed to be a learn from each other situation? How is this different from Resolution A-4 passed in August? Too much is unclear –“ for teachers to participate in select professional development” who gets to select the ‘ select professional development’ – Mastery? What exactly is this special Mastery professional development? Mastery “will compile progress data and work with the School District team to access and analyze data from the District” – Why are employees of a private enterprise with little public oversight collecting and analyzing District data. If principals are made aware of which teachers are participating, can the program really be voluntary? RESOLVED, that the School Reform Commission authorizes The School District of Philadelphia, through the Superintendent or his designee, to accept, with appreciation, the donation of $45,080, from Mastery Charter School as part of a grant from the William Penn Foundation, to pay for school-based peer coaching programs at Nebinger, McDaniel and Mayfair Elementary Schools, for the period commencing October 27, 2015 through June 30, 2016. Description: The School District, in partnership with Mastery and with support from the William Penn Foundation, is seeking to pilot a coaching program that targets a population of District teachers who are currently not served by existing District coaching programs and builds informal leadership capacity within schools to increase the opportunity for professional growth for all teachers. The ultimate goal is to build a program that yields significant gains in student growth and achievement through improved instructional practice, attained through peer coaching. The purpose of this program is to support the creation of an effective, school-based peer-coaching model that leverages excellent teachers to coach other teachers who are either adequate or good at their craft and want to improve from adequate to good or from good to great. Through this program, District master teachers will coach fellow District teachers who voluntarily participate in one of three coaching cycles per year. The program expects to impact 30 teachers with 1:1 coaching in each building and 90 teachers across three schools through comprehensive professional development opportunities. The participating schools are Nebinger, McDaniel, and Mayfair, each of which submitted an application of interest to participate in the program. Time for coaching will either be scheduled during release time or compensated prep payback time. Additionally, coaches will be compensated for time spent on the project outside of school hours. The coaches and their principal will receive ongoing professional development from Mastery throughout the school year. Mastery will compile progress data and work with the School District team to access and analyze data available from the District at the teacher and school level to gauge impact of the program. While the focus of the project is on creating a sustainable model inside participating schools for providing effective professional development through peer to peer coaching, the Mastery team with also work with the School District’s Office of Effectiveness to create central leadership for the program so that the District will be able to run the program internally without Mastery supports in the future. The grant funds will pay for EC and release time for peer coaches to support teachers during the school day and after school; for teachers to participate in select professional development after school, and for substitutes when coaches or principals are attending professional development during the day. These funds are directly connected to Resolution A-4, approved by the School Reform Commission on August 20, 2015. Why is there a need for “Candidate Phone Screening Services’? What do they do for $10,000? Given Dr. Hite’s announcement about the upcoming turmoil for 5,000 students we need to pay attention to the School Redesign Initiative and how it is being used. At a recent SRC meeting the principal at a school in the first SRI cohort proudly stated that he now had a new faculty. Is SRI a mechanism for forcing teachers to reapply for their jobs? Ratification of Amendment of Acceptance Period of Grants and Donations – Barra Foundation RESOLVED, that the School Reform Commission hereby ratifies the amendment by The School District of Philadelphia, through the Superintendent or his designee, to extend the acceptance period for grants and donations from the Barra Foundation, originally authorized by Resolution A-36, approved by the School Reform Commission on August 21, 2014, by extending the acceptance period from the original date of September 30, 2015, approved in Resolution A-36, to June 30, 2017. Description: Resolution A-36 approved the acceptance of a grant from the Barra Foundation to support the School Redesign Initiative during the 2014-15 school year and summer. Although Resolution A-36 was intended to cover the time period from August 22, 2014 through September 30, 2015, additional funds remain for the grant due to the fact that the District selected fewer than the maximum number of schools in the first round. Therefore, funds remain to support additional redesign selected during the 2015-2016 school year to implement their redesigns during the 2016-2017 school year. The Barra Foundation has granted the district permission, pending SRC approval, to extend the grant for a second year. This resolution amends Resolution A-36 only by extending the end date to June 30, 2017, and makes no other changes to the previously approved resolution. This resolution is being submitted as a ratification now, as key staff were unaware the acceptance period was coming to a close at the end of September. Thinking of all the wonderful artwork stripped from schools and in storage. At this point with all the turmoil you almost don’t want to see them returned to schools because what would happen to them? We need to remember that the Artwork is still with us. This is not a criticism of Playworks but does your school have a Home & School or Friends Of group that can raise $15,000? Once again these programs are available for middle class schools or schools with corporate connections. I guess this is the equity Dr. Hite keeps talking about. Equity for those who can afford it. This Resolution is confusing. First they say they are going to pay for services at three schools, then they state they are accepting a donation of services at 12 schools including the three first mentioned. Which is it? FURTHER RESOLVED, that the School Reform Commission authorizes The School District of Philadelphia, through the Superintendent or his designee, to execute, deliver and perform a memorandum of understanding with Playworks for the provision of these programs at these schools, for the period commencing October 16, 2015 through June 30, 2016. Description: For the last 20 years, Playworks has been positively impacting children’s health and well- being by harnessing the power of play during recess and throughout the school day and creating valuable opportunities for children to grow physically, emotionally, and socially. A first-of-its-kind nationwide Gallup Poll of school principals conducted in 2009 revealed that principals overwhelmingly believe recess has a positive impact on students’ social skills, as well as achievement and learning in the classroom. However, the poll also found that many schools cut recess to meet testing requirements, many schools continue to take recess away as a punishment for bad behavior, and due to the multiple challenges that recess presents, schools are looking for help. Furthermore, a study published by the Journal of School Health in 2011 by Kristine Madsen, MD, MPH Professor at the University of California, showed that students exposed to one year of Playworks programming showed statistically significant increases in the following four protective factors as compared to students with no exposure to Playworks: physical activity, problems solving skills, meaningful participation in school and goals and aspirations. The study noted that these factors are essential for maintaining a positive developmental trajectory despite adverse circumstances and are “associated with positive social and academic outcomes”. Playworks’ coaches are the key to the program’s success and the people who implement the five-component, youth development curriculum to build young people’s academic and life skills and provide them with meaningful role and leadership opportunities and foster supportive relationships with peers and adults. The program specifically works to engage kids who are not typically involved in play on the playground—those who do not feel safe, those who are intimidated or bullied, those who are overweight, and those who feel their skill level is not up to par. To the delight of the children, the coach plays, too, which provides an element of fun as well as the opportunity to model appropriate behavior. Playworks has been supporting the implementation of socialized recess in Philadelphia public schools for the past several years. For the coming year in Philadelphia, Playworks has been working with several schools and the District’s Office of Health, Safety and Physical Education, as well as with multiple local funders and community groups to minimize the cost to schools for the programming. To begin the process, interested schools contact Playworks and local partners. • The City of Philadelphia is providing Playworks $180,000 toward the cost of the program at Sheppard School, William Cramp Elementary School and Disston Elementary School. • First, Playworks’ coaches organize recess, by establishing specific areas on the playground for games, developing standard rules for behavior and teaching conflict resolution techniques, such as rock/paper/scissors so that students can resolve conflicts on their own. • Second, coaches work with teachers to provide 45 minutes of game time specifically for their students during the week. This allows students to receive one-on-one attention, enables coaches to reinforce positive social and playground behaviors, and strengthens the student-teacher bond by enabling students to see their teacher in a new “playful” role. • Third, coaches nurture a cadre of 4th and 5th grade students to serve as Junior Coaches. This peer leadership program has been successful in improving children’s self-esteem, social behaviors and desire to do better in school. • Fourth, coaches provide high quality after-school programming for 4th and 5th graders, including homework assistance. • Fifth, coaches run interscholastic sports leagues for 4th and 5th graders in a variety of sports, including co-ed volleyball and all girls’ basketball. These non-competitive teams are designed to build skills, provide children with a team experience and teach good sporting behavior. In the 2015-2016 school year, Playworks will provide a program model called TeamUp. The purpose is to establish a framework for implementing a socialized recess program while also providing consultative trainings to school staff that will be primarily responsible for running this program at their school. The goal of the program is to establish a culture at recess where play is valued and can positively impact school climate, which is also run by the school staff with the best practices and consultative support of Playworks professionals. Welcome to the second edition of Eyes on the SRC. The next SRC Action Meeting is Thursday September 17 at 5:30, 440 North Broad Street. Call 215 400 4180 by 4:30 on Wednesday September 16 to sign up for your 3 minutes to speak on Thursday. When you sign up, identify yourself as a community member, as only a certain number of persons from one organization are permitted to speak. We support each other so we are not alone when we speak. Please consider attending as every voice is needed in this struggle. If you want some help with your testimony, email us—we will be glad to help. Included here are resolutions to be voted on by the SRC which we believe will have a serious and lasting impact on the academic and financial future of the district. If you have any questions about them or about the SRC in general, email us at philaapps@gmail.com. Last Spring only five new charters were permitted to open. Charters were granted to charter operators KIPP (KIPP DuBois High School); Mastery Charter School District (former Gillespie Middle School, now to be an elementary school to feed into Mastery Gratz); Independence Charter School (new elementary school in West Philadelphia); MaST Community Charter (additional campus in Lower Northeast); and Freire (new high school called Freire Tech). How can Belmont Charter, Boys Latin Charter, and Tacony Academy Charter “add facilities location” when their applications were not approved? Is this going to be the new charter school expansion policy –to simply request a new location? Here they come! Rejected last spring? Try again with a new revised application for your charter school. “Volunteer tutors will be integrated into the daily classroom instructional strategy.” Guess who is going to supervise these volunteers? Yup. Classroom teachers. Instead of smaller class size, Reading Specialists, Reading Recovery, and School Librarians classroom teachers will now have volunteers to supervise. Would this be acceptable in a private school or in the suburbs? Absolutely not! Volunteers should be supplemental not taking the place of experienced educators. Volunteers are well intentioned but do not have the educational background or experience. Volunteers are a mainstay of the Doomsday Budget mentality created by this administration. Our students deserve a full-time, every day professional staff. “Description: This William Penn Foundation has provided AARP a grant to conduct a project to provide literacy support in K-3 classrooms with high poverty populations. Utilizing the AARP network, 56 additional volunteer teachers will be recruited, as well as 8 new Team Leaders. Schools will opt-in to this program in order to participate. Volunteer tutors will be integrated into the daily classroom instructional strategy. Teachers will supervise the various literacy interventions, focusing on general classroom literacy support across the curriculum. Volunteers will utilize strategies including one on one tutoring, interactive technology-based cross curriculum literacy assistance, and guiding reading group sessions targeting specific literacy problems. Team Leaders will monitor implementation of blended tutoring through daily observations. Literacy Coaches will conduct weekly observations and real time one on one tutor couching at each site. There will also be written mid-year evaluations completed for all tutors. Another example of outsourcing services – aren’t custodial staff at 440 unionized ? “RESOLVED, that the School Reform Commission authorizes The School District of Philadelphia, through the Superintendent or his designee, to execute, deliver and perform a contract with Elliott-Lewis Corporation, to provide property management services at the School District’s 440 N. Broad Street Education Center, for an amount not to exceed for $3,800,000, for the period commencing October 1, 2015 through June 30, 2018, with two one-year options to renew through June 30, 2020. Description: The proposed award represents completion of the public solicitation under RFP-455: Property Management, issued to the public on July 1, 2015. The bid due date was July 28, 2015. The vendor will be responsible for the cleaning management and operational maintenance of 440 N. Broad Street, an office building with a square footage of 740,000 square feet and usable square footage of 570,000 square feet with current occupancy of 600-700 employees. The vendor is responsible for the management of all building operations. Work includes the direction of a staff engaged in the operation, maintenance, and cleaning of building(s) and in the maintenance of the building envelope and roof, equipment and care of the grounds. The vendor is also responsible for the management of 19 full-time School District of Philadelphia cleaning and maintenance employees, according to their union contract. The vendor approves purchases, initiates requisitions and assumes responsibility for the receipt and distribution of supplies, equipment and materials for the operation and maintenance of the building(s). Work also involves periodic inspections of building(s) and grounds for cleanliness, proper maintenance and safety. The District has restructured the contract to include a base contract for personnel and basic services, and to require all other expenditures, including subcontractors and ancillary services, to be approved in advance. This gives the District greater control over spending on this contract. The personnel costs are lower in the awarded vendor’s proposal than they were in the previous contract. Instead of having a full time counselor and nurse in every building, the District is now offering to send teachers from up to 3 schools to this training. Every school needs a stable staff that includes a counselor, full-time nurse, and support staff to meet the needs of our students. RESOLVED, that the School Reform Commission hereby ratifies the acceptance by the School District of Philadelphia, through the Superintendent, of services valued at $25,000 from the Fund for the School District of Philadelphia, made possible by a grant from the Van Ameringen Foundation to be used to improve school climate and safety and address students’ mental health needs, for the period commencing August 1, 2015 through April 30, 2016. 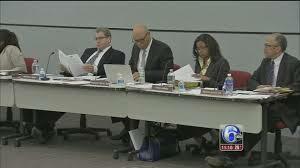 This is presented as a partial ratification because the funds were received by the Fund for the School District of Philadelphia but the program has not been implemented. Description: With the funding received, the District will choose up to three schools to participate in an 8 hour course called Youth Mental Health First Aid (YMHFA). One elementary school will be selected based on the percentage of children who are reading below grade level and one high school will be selected that is not receiving any other climate program and was at one time designated as a Persistently Dangerous School. YMHFA is designed to be disseminated widely throughout the community at all levels of the populace. The program empowers individuals from all personal and professional backgrounds to recognize the signs and symptoms of adverse behavioral health conditions and respond to mental health crises, directing those in need to appropriate supports, including professional- and self-help services. The District is an important partner to the Department of Behavioral Health and Intellectual disAbility Services (DBHIDS) in training in YMHFA and its efforts to train its staff will help DBHIDS reach that goal. Because YMHFA is an eight hour course, few teachers have been trained. The funding will provide a stipend to District teachers for attending the course on a Saturday or other non-school day. In addition, the funding will provide a $500 incentive to those schools that have over 60% attendance at a training. The District will work with each principal to establish the dates to train the staff. The trainings can be spread throughout the year and allows for a majority of the staff in the schools. To track the number of individuals who have received training in YMHFA, trainings will be scheduled through the District’s professional development system, and individuals will be required to register in advance of the training. Participants will sign in upon arrival to the training and sign-out at the conclusion of the training. This method ensures that participants have received the prescribed full amount of training. How much are these leases ? Who are these companies the District rents from? If Source 4 Teachers pays $11,500 per year ($16.50 per sq. foot)to rent at 440 (Resolution A-24, August SRC Action meeting) then what is the rate for these two properties? Please take a minute to look these over. We need more eyes on the SRC. We need to make sure that our children benefit when the SRC spends money—not a charter investor or edu-entrepreneur. Email us at philaapps@gmail.com . Check out our Facebook page and our APPS website.